Restoring the Past | Rocket Steps. The art of communication. Here’s a page from ’Magic Lamp Boy’ 1997, showing the process of retouching the original artwork, it was a ‘mini-comic’ so all the artwork was A5. Most comics were produced ‘half-up’ or ‘two-up’ (working big then reducing the original) though I really enjoyed working small with a really fine brush. The original still has a lot of ‘printers blue’ on it. This is artwork and lettering done with a blue pencil that doesn’t show up when the artwork goes to print (or photocopy). To be honest this page is in a bit or a state, and I even found food crumbs on some pages (yuk). 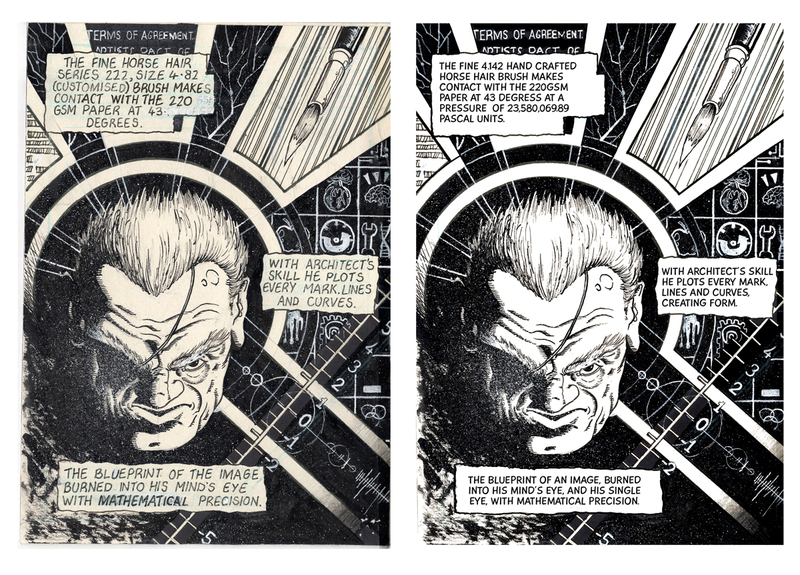 Image on the right is the touched up hi-res scan, the blacks have all been evened out have, ghost lines removed and lettering re-done. I would eventually learn how to letter like the pros’ Tom Frame or Dave Gibbons, but not yet. Going back to old work, I’ve tried not to ‘do a George Lucas’ as my mate Sean put it, so I kept some of the original imperfections, cleaning up lines and scuffs.